I receive around half a dozen submissions of abstract games each month. Most of them are great designs. I hope I can publish all of them, but by now I can't. Not enough time. Morevover, I'm not focused exclusively on abstracts at the moment. So I've decided to create a continuous abstract game design contest. How does it work? Simply add your game to this list (first you must add the game entry to the bgg database), and when it reaches enough thumbs up, I will contact the author and propose and agreement. How many thumbs up? I still don't know. I will try to fix this number soon. 2. The game must be an abstract. It can be lightly themed (like Hippos & Crocodiles). 3. The game must be finished. No variants, corrections or whatever. 4. Games already published are accepted too, as long as the author can license it to other publishers. 5. You can submmit other author's games. 6. You can submmit as many entries as you wish. 7. Any entry can be rejected because of production issues. 8. 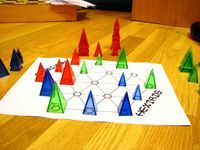 Games that can be easily home made or that can be played with existing NESTORGAMES games could be rejected for obvious reasons. Sorry for this. When and if a game is published, I will give a free copy to a randomly picked geekuser among the ones that gave this list a thumb up. So what is an abstract game? That's a difficult question. Theoreticaly an abstract game is a game with no theme at all. Hence the word "abstract". EDIT: By now, 2 games have reached the 40 votes barrier. 40 is a good number. I will fine-tune it over time. EDIT: 3 games have reached the 40 votes barrier so far! Well done! EDIT: As one of the entries has reached 50 votes and the geeklist has more than 50 thumbs, it is time to raise the barrier. EDIT: 4th winner! Time to raise the barrier again. Edit: 7th winner removed from the contest by the author. Edit: Barrier raised to 200! It's like Hex, but with pentagons instead of hexagons. The image shows pieces with holes in them, but this is not necessary for a physical set. As long as each piece is small enough that you can see the color of the pentagon it sits on, the game should work fine. This won an Icehouse game competition. It's for 2 or 3 players. I wrote a module for the software Zillions of Games, but I never submitted it to the ZoG website. I intend to submit it next week, Saturday 7 Nov. 2009. But you would have to buy Zillions in order to use this module. The 1st game is in the BGG database as Dustin, but the name has since been changed to Odd. It's played on a hexhex5 board. 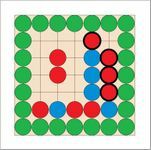 One player is trying to ensure that when the board is full, there's an odd number of groups of a certain minimum size (both colors are counted), and the other player wants the number of such groups to be even. The number of groups at the end of the game will be small, usually between 3-6. Importantly, a player can play either of two colors on her turn. It's tricky, and it feels like playing several simultaneous connection games at once on the same board, each of which influences the others. Coil is a 2-player connection game on a hexhex7 (or larger) board, where one player is trying to form a loop of stones in his color, while the other is trying to prevent the loop's formation. There's a "chicken ballot" at the beginning of the game to ensure that the two sides are balanced. Because loops come in a wide range of sizes and shapes, and have many degrees of freedom, the game has rich tactics and strategy. Small loop threats force players to focus on local battles while large loop threats force them to think globally, and to consider how the local battles fit into the global war. When I first invented the game, I wasn't excited about it, since it seemed like "just another connection game", but then when I had playtesters provide feedback, the feedback was highly positive, much more than I expected. Playing it myself, I too feel a special communion with it. I think this is an important lesson in game design: even if you're a seasoned game developer, it can be very hard to infer game quality from a reading of the rules. Abstract game designers, myself included, rely far too much on such inferences when evaluating game concepts, probably because we love the "eureka" moment that a pure, beautiful concept gives us, more than we enjoy evaluating how real people respond to our games in actual play. 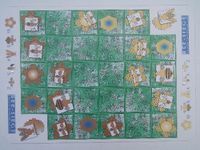 Mundialito (Gold Cup) is an abstract strategy board game of movement and attainment whose objective is for you to score a goal (getting your ball to the last row) before your opponent. Move your pieces, push and jump over your opponents pieces until you score a goal. This game is one of the finalists of the 2007 Ciutat de Granollers de Creación de Juegos. "It is a truth universally acknowledged that everybody loves seeing penguins sliding around on the ice. And soccer is the world's game, right? So take some cute families of penguins, give them an icy soccer field and a ball, and watch the slippery goodness that ensues. . ."
Despite the theme-y blurb, Penguin Soccer is a perfect information abstract for two players. Try it for free at turn based web gaming site Super Duper Games and if, after playing, you would like to see a professionally produced version, thumb this item! So, my question for Nestor: are you able to produce "penguin" pieces which are capable of indicating which one of 8 directions they are pointed, or if they are standing, and if they have possession of the ball? Researcher in AI and automated game design. 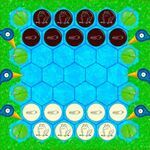 ESP is a tile placement game of strategy, deduction and extrasensory perception. Suitable for 2-4 players. Hop It! is a game for two players set in a lily pond full of nervous frogs and tadpoles. They’re nervous because the pond is also a nesting ground for the Blue-Headed Frogmuncher. WYPS game is word game played online on www.littlegolem.net. Game is combination of connect game Y and word game. I've re-tooled my original entry to your First contest ("Arctic Meltdown"). This version addresses the problems you had with that entry; that is, I've added a healthy dose of randomness, removed the war-game theme and received some good help writing the rules. Bee-Siege is a two-player game of strategic positioning, lasting eight rounds (allow one hour to play). Players co-ordinate their small swarm of Bumblebees, Queens, Honeybees and Workers by selecting order tiles from a shared pool. The player with the most points (usually, controls the most flowers) at game’s end is the winner. Note: No Bees will be harmed during the course of play! Thanks again for giving an Average Joe a glimpse of the publishing world. If you love perfect information, deeply strategic and tactical games, that still play in 20 minutes and let two players clash on the battlefield in a brilliant, balanced fight for dominance, this game is for you. Symbol, the abstract battle simulation game, is played on a 7x7 grid divided into three areas and nine regions. 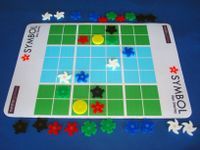 Players use green, blue, white, red, and black pieces symbolizing the Aristotelian elements (earth, water, air, fire) and the element of "death" to control the board’s regions and attempt to capture their opponent’s leader piece. It plays a lot like chess with more freedom to select and customize a starting army and an empty board which fills as the players develop their strategy and use their leader's power to reinforce the battle with more units. Each player chooses 15 pieces of whichever five main unit colors in whatever numbers they prefer as their army, plus one leader piece. Each unit has different rules for movement and powers, and as the players take turns vying for positional control and attempting to capture enemy pieces, they can also combine their pieces into stacks, conferring multiple powers or more optional movements to the stack of pieces. On a player’s turn she can use the power of any one of her pieces on the board (which generally involve movement, pushing and killing enemy units, or adding new units to the board). She could also use the powers of multiple pieces if those pieces occupied the same space on the board and formed a stack. Knowing when to stack and unstack pieces and clever tactical use of the powers of the pieces are key to winning the game. EDIT: It looks amazing, Nestor. Thank you, everyone! Subdivision is a great placement game for 2-4 players by Carlton Noles. It would work well with your format. A chess variant played with stackable pieces. Calls for devolopment of new strategies! Another game that I didn't author, and whose author is unaware that I'm posting his game: Santorini. A fascinating multi-level game which many BGG users have said they'd like to get a proper copy of. However, without making the tiles have side length less than one inch, this one might be hard to fit under the weight limit. Still, worth looking at, I reckon! This should fit nicely into the Nestor collection. I printed a board to A4 and it's a little tight, but still quite playable. The only unique piece is the "portable portal" (see details on the BGG page) which is really just a chit the same size as the spaces on the board, and there's a d4 for moving it. Zaic is a 2-player 15-minute abstract that can be played on any flat surface without a board. Inspired by the ziggurats of Mesopotamia and the tiles of my bathroom floor, each player vies for the largest area of his tiles by connecting his own and covering his opponent's. 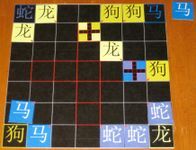 Each player is given 19 tiles in three sizes. 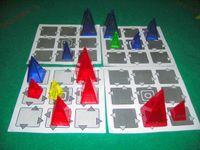 As the game progresses, it gets more difficult to play the larger tiles. 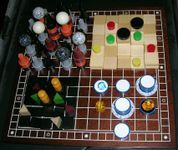 However, the game ends when one player cannot make a move, so forcing a quick end by having no playable tiles left may be an advantage. Mix-Match is a 2-4 player perfect information abstract game. It features high interaction, low downtime, and high strategy. The game is fairly simple. You swap 2 colored pieces, then remove a set of two or more that are all directly adjacent. You may then collapse the board in one direction. The twist comes in that the pieces you swap and the pieces you remove don't have to be in any way connected. They don't even have to be yours! Mix-match takes about 20 minutes to play, wether with 2, 3, or 4 players. 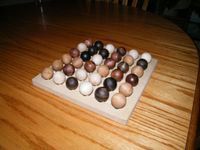 It can also be produced as a wonderfully beautiful wooden (as shown) or wooden/glass set with marbles that ride in rails for the "collapse" portion of the game, or a highly-portable version with a board that folds to just 3" on a side. Nestor, someone recommended adding Flume to your list. After looking at your forms 1 and 2 it does seem to be a good fit. Flume is extremely simple in rule and form, yet rich and robust in play. Pods are tiny animals, living in the darkness of unknown caverns. They are made of a head and some feet (bipod have 2 feet, tripod: 3 ... octopod:8). A foot may be small: a foot for walking (controls 1 square forward) or big: a foot for running (controls the aligned squares forward). Players alternate turns and place their pods in the cavern (a 7x7 grid) but have to deal with the Pods 'way of life': respect your opponent tiny space. So each foot of any pod can never threat a square occupied by an enemy pod. When a player is unable to enter a new pod in the cavern, he loses the game. Printable board and pieces included. Pyramids don't need to be used, could very easily be replaced with three different sizes of frog shapes. Win by bearing off your pieces, and/or getting your opponent to capture them. Both facilitate this for yourself and complicate it for your opponent by using your jobber, who moves at impossible speeds within the confines of the jobbers' plus-shaped area in the middle of the board. I think Tschuk would be an excellent choice for the modern classic nestorbag. No board is required, although it could be useful for different rule sets.... Heinrich Glumpler has given me the OK to enter this cool little game system in the NESTORGAMES continuous abstract game design contest, and I'm brewing up some additional rulesets that could be included with it, pending Heinrich's and Néstor's approval, of course. To explain the components: There are 21 coins with value 1-7 depicted on each side of the coin. The back never matches the front, and the 21 coins are all the combinations of 1-7 with that constraint. This provides the very interesting trait flexed in the original Tschuk rules, that the only thing that you know about a single coin is that what you see on the front is not the number on the back. As you see more of the coins, you can start to deduce what's out there. An opaque bag is very important in order to randomize the coins; however, I don't think it needs to be a large bag like the The Aztec Market bag. Besides, the little, zippered bag is much cooler with its icon on the end. 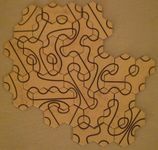 Topology is a tile placement game for two players. The players alternately place double-hex shaped tiles with 5 curved lines in order to build rings. The longer the ring, the higher the score.